It is always fun to see an image and then link it back to another artist and deduce an influence or heritage, conscious or unwitting. Today, on Art Knowledge News, that wonderful daily Web magazine, there was the announcement of an exhibition opening at the Boise Art Museum. The accompanying image, a reproduction of a detail of Virginia Partridge, is a marvel of accuracy, composition, rhythm and energy. It was painted in 1825 but printed in 1829. 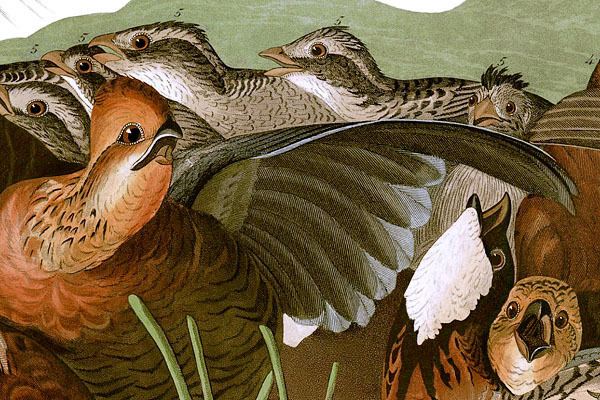 Detail from Plate 76 of John James Audubon's Birds of America. Virginian Partridge (Northern Bobwhite) under attack by a young red-shouldered hawk. Restored by RestoredPrints.com 2008. As I delighted in the image, I suddenly realised that I had seen the same sort of fidelity to nature, allied with a wonderful rhythmic energy and sense of colour in another artist's work. Walter Anderson , a remarkable artist who was born in 1903 in New Orleans, spent many years recording the natural world in the Gulf of Mexico - work made even more poignant given the current oil spill disaster unfolding in the same areas. He spent a great time of time alone, after 1947, on Horn Island, one of the Mississippi Gulf Coast barrier islands. His watercolours of turtles, fishes, birds of every description, trees and water are marvels of luminosity and freedom. I had hoped to be able to illustrate this entry with one of the images which I find so evocative of Audubon's bobwhite illustrated above, but alas, the copyright situation with the Walter Anderson Museum precludes it. 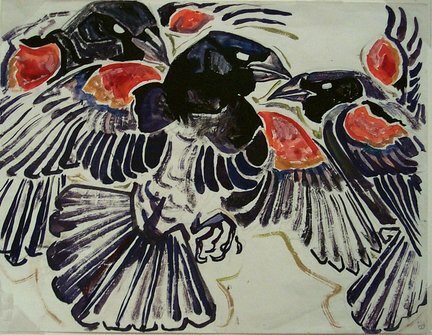 Nonetheless, the painting of red wing blackbirds is well worth the link-click to see it. There is a good selection of his work on the Google images for Walter Anderson- his sense of composition comes through clearly. Anderson was given an art education at the precursor to the Parsons School of Design and then the Pennsylvania Academy of Fine Arts before spending time in Europe. There he claimed to be more influenced by the caves and cathedrals than the museums' contents. Nonetheless, as I look at Audubon's wonderful studies of America's birds, I can't help feeling that, wittingly or unwittingly, Walter Inglis Anderson was greatly indebted to him. Just as we all are, as artists, down the chain of years when we learn of how other artists react to the world around us. We all stand on the shoulders of giants.